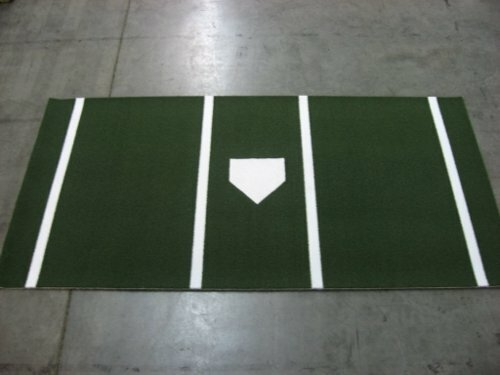 These Baseball Batting Mats measure 6′ X 12′ and come in field green and clay colors. They are designed for a soft realistic feel and come with a 5mm foam backing. These mats can be used indoor or outdoor and are weather proof and spike proof. 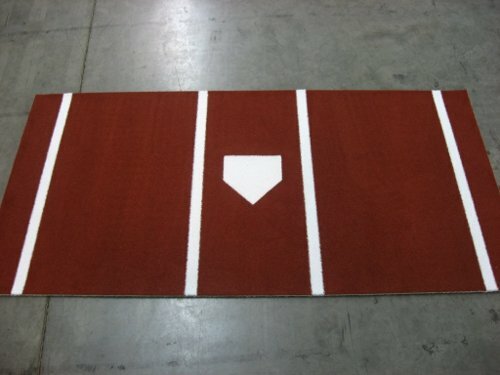 Our Baseball Batting Mats will give you more opportunities to practice in all weather conditions. Baseball diamonds in parks and high schools and college grounds are exposed to harsh weather conditions throughout the four seasons. Custom Turf Outlet’s Baseball and Softball batting mats are tough, durable, and backed by a five year manufacture warranty. If you practices indoors or outdoors on the diamond, a batting mat is great for improving on a consistent swing. We understand how much wear and tear these batting mats take from baseball and softball teams. Easy to move to multiple facilities. Consistent performance over time and use. Practice after a rain out. According to The Fundamentals of Hitting a Baseball on Stack, footing is the foundation of maintaining balance throughout the swing. A batters stance should be comfortable to shift the load of weight to the back foot. Consequently the entire body moves in unison. Balance of the body from the start of the swing all the way to the follow through, is vital. Your footing affects the ability to track the ball accurately. According to Stack, the batter should stands a bat width plus and arm’s length away form the diamond. If you are looking to develop consistent batting fundamentals, and to refine your hitting mechanics, a quality and durable surface is crucial for the proper rhythm, load, separation, weight shift and the release. When you commit to a swing on the backside of your body, the force generated as you turn toward the baseball will abruptly stop, by the front side of your body to start the rotation. This abrupt and firm stop of rotation will abuse the surface you are standing on, and therefore will wear down over time. Using a quality batting mat will give you more time to practice and as a result do less damage to the baseball diamond. Polypropylene with 5mm Foam Backing. Bought the clay color with home plate. Very happy with the quality and value! AWESOME PURCHASE, KIDS LOVE IT!!! Arrived same as looked on photos – heavy – should last for years. The shipping was quicker than I thought with free shipping, it looks great, very sturdy and should last a very long time. The mat came exactly as described and will be used in a facility. I will definitely be ordering from this company again! We have been hitting on this mat in our basement for about a year now and it shows no sign of wearing out. I was nervous at first on buying this, but I am really happy about this purchase. The clay color looks great and hasn’t faded at all. Excellent hitting mat! We bought a number of these for our baseball & softball programs. It has really helped our athletes improve their pre-pitch warm-ups when entering the batter’s box. It has also helped us to hold practice even after days of rain, we just lay these mats right on top of the wet grass. I’ve purchased too many hitting boxes to count and they never last but I purchased one of the clay ones about 2 and a half years ago for my teams indoor hitting facility and another one recently for my garage and these hitting mats are great! I did some research before I bought this and I’m glad I did. Down here in Orlando a lot of people have the custom turf mats. A friend of mine had, who played pro baseball recommended it to me. We have been hitting on this baseball mat in our indoor facility for about a year now, and we are so surprised that it shows no sign of wear. We are very satisfied about buying this. We bought the clay color and it really looks nice and authentic, to what you’re familiar with at an outdoor diamond. My grandson totally loves this mat. The days of slipping on the basement floor are gone. 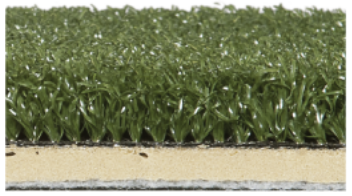 It truely has a real feel a natural turf, only it doesnt wear down nearly as fast. My grandson gets most use out of it by practicing his tee work and soft tosses. Very durable and heavy. Arrived quick after I purchased. Great product. Perfect for our home batting area in our garage attic!! !